(UT-Southwestern – Dallas, Tex.) - Dr. Robert Haley and colleagues at UT Southwestern have been conducting epidemiologic, clinical and laboratory research on the "Gulf War syndrome" and related neurologic illnesses in Gulf War veterans since March 1994. The work has been supported by a continuing grant from the Perot Foundation and by a cooperative agreement with the U.S. Department of Defense. The objectives of the research are to define new or unique clinical syndromes among Gulf War veterans, determine their causes, identify areas of damage or dysfunction in the brain and nervous system responsible for the symptoms, develop a cost-effective battery of clinical tests that can diagnose the illness, search for underlying genetic traits that might predispose to the illness, and perform clinical trials of promising treatments. The initial studies identified three primary syndromes in a Naval reserve construction battalion (seabees) that appear to be unique, demonstrated that the syndromes are associated with subtle dysfunction of the brainstem and lower parts of the brain, and found epidemiologic associations between the syndromes and risk factors of exposure to combinations of chemicals in the Gulf War. Genetic studies have identified a genetic trait (PON1 enzymes) that may explain why some soldiers sustained brain damage from exposure to neurotoxic chemicals while others working alongside them remained well. Most recently, research using magnetic resonance spectroscopy has demonstrated a loss of functioning brain cells in deep brain structures of ill Gulf War veterans. Additional commentaries by Dr. Haley have challenged the government's stress theory of Gulf War syndrome and findings of no difference in mortality, hospitalization and birth defects between Gulf War-deployed and nondeployed military populations. Additional research and publications are in process. 1. A list of the papers published in peer-reviewed scientific journals. 2. 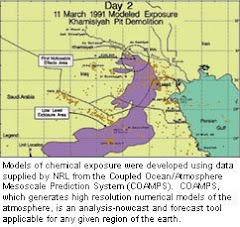 Findings showing that there is a Gulf War syndrome, it is due to organic neurologic dysfunction, and it is associated with exposure to combinations of chemicals in the Gulf War. 3. Dr. Haley's refutation of the stress theory of Gulf War illness. 5. 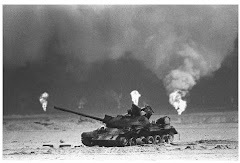 Findings on the genetic predisposition to Gulf War Syndrome. 6. Findings linking dizziness in Gulf War Veterans to subtle brain injury. 7. Findings on brain cell loss by magnetic resonance spectroscopy. 8. Findings on abnormal brain dopamine levels. 9. Stress does not cause pyridostigmine to enter the brain.